Is there any relation between the two Miltons (Kennedy and Kylen)? Or just recruiting coincidence? Thanks! The power of the message board strikes again. Verbal Commits says that we offered Tyler ('Dishon') Smith (6'5", 220 lbs) on July 15th. He is from Fairborn, Georgia and attends TLAP Sports Academy. Wonder if this has anything to do with our coaches attending the Peach Jam recruiting event in South Carolina? 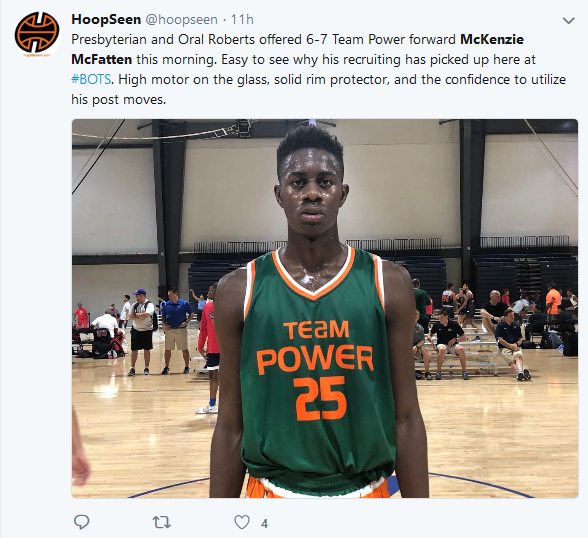 According to Verbal Commits, we offered Trevon Reddish (6'4" - SG from McDonough, GA) and Isaac McBride (6'1" - PG from Little Rock) on July 22nd. Both attend Christian high schools. I count at least 10 offers outstanding for the class of 2019. Two member of the 2017-18 Jesuit Dallas basketball squad earned major awards to headline the University Interscholastic League (UIL) All-District 9-6A team, announced after a vote by the district coaches on March 5. Senior Reid Hatzmann earned District Defensive Player of the Year plaudits, while junior Max Abmas was named the Co-Offensive Player of the year. Abmas was the Rangers' leading scorer with 16.1 points per game, adding 565 points to his career scoring column while ended the year shooting a 46.3 clip. Burying a team-leading 106 three-pointers for a 43.4 three-point shooting percentage, Abmas was the team's top free-throw shooter with a 84.5 success rate and 93 converted attempts from the charity stripe.